Calculated Risk: John Burns: Builder Confidence "Feels more like a 50 to me"
John Burns: Builder Confidence "Feels more like a 50 to me"
Yesterday the NAHB reported that builder confidence declined sharply to 60 in November from 68 in October. Here are some interesting comments on confidence via twitter from John Burns, CEO of John Burns Real Estate Consulting (a premier RE consulting firm). 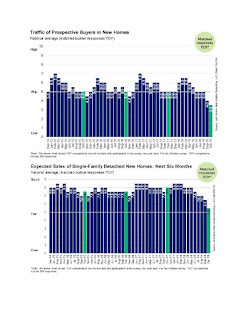 "Our survey of new home buyer traffic and expected new home sales from 200+ of the exact same builders. Green is the last 4 Octobers. Hard to believe NAHB that HMI is a 60. Feels more like a 50 (normal) to me."